The 2012 Ford Fiesta is having a huge impact on the European market and is the number one selling small car across the pond. Ford says the little compact car was Europe’s best-selling car in September, for the third quarter and for the first nine month’s of this year. The figures were compiled by an independent provider of automotive data, JATO Dynamics and were based on sales in 30 European countries. And with more changes coming in fuel-efficiency, the Ford Fiesta could be having more of an impact worldwide with the 2014 model. According to the report from JATO Dynamics, 31,468 Ford Fiestas were sold in September, 66,603 in the third quarter, and a total of 238,345 units were sold in the first nine months of 2012. The Ford Fiesta outsold the popular Volkswagen Golf hatchback by more than 27,000 units which makes the numbers even more impressive. 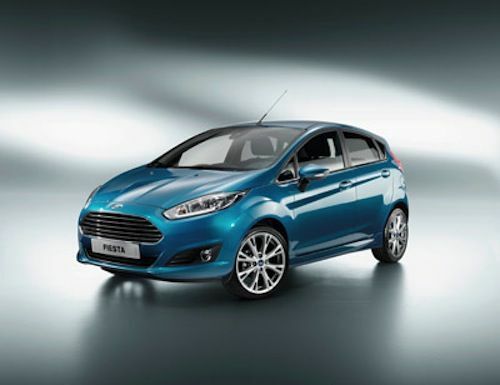 The new Fiesta is sure to attract even more buyers when it gets the new 1.0-liter EcoBoost engine. The new three-cylinder engine from Ford is being used first in the European Ford Focus and will be offered in the C-MAX and B-MAX in Europe later this year. The engine has been wildly accepted in Europe already in the Focus, and should be a big hit when it is offered in the smaller Fiesta. The small fuel-efficient engine has been highly acclaimed and gets excellent fuel-mileage. It achieves 58.9 mpg in the Ford Focus (which is the European standard for estimating mileage) and is having a big impact around the globe. “For a three-cylinder to power a vehicle like the Ford Focus with such ease proves the future is very, very bright for the internal combustion engine,” said Slavnich of Engine Technology International. And Ford has also developed a new ECOnetic diesel engine in the Ford Fiesta that achieved 90 mpg in the Fleet World MPG Marathon event that was recently held in the UK. The all-new global 2014 Ford Fiesta was unveiled in Paris and is also getting a lot of attention. It also features the fuel-efficient EcoBoost 1.0-liter technology and is expected to deliver best-in-class fuel-economy. It will be the first among its European competitors to get Active City Stop, a system designed to help drivers avoid low speed collisions. The new enrty-level compact will also feature Ford’s SYNC in-car connectivity system. If all cars in Europe are included, the Fiesta ranks as the number two best-selling car overall in Europe. Ford is changing the game in Europe with the Fiesta, and it will be interesting to see how the new 2014 Ford Fiesta does on a global level. It sold 27,000 units more than the Volkswagon Golf. Really? Did you mean the Volkswagon Polo? I thought the Golf was Europe's best selling car!! !